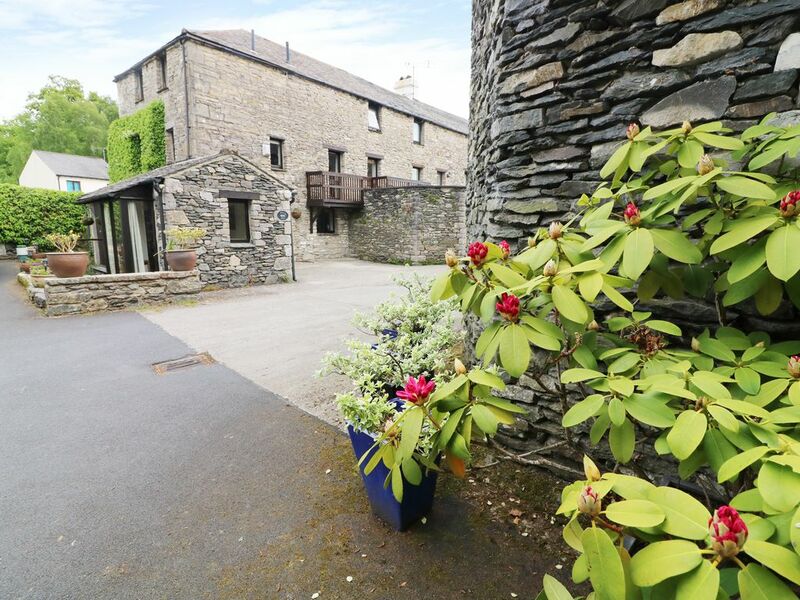 This attached barn conversion sits in the village of Lindale in the Lake District and can sleep four people in two bedrooms. The Hayloft is a stone cottage located in Lindale in Cumbria. It comes with two bedrooms which include a double and a twin, there is also a family bathroom, the cottage can sleep up to four people. Its interior also includes a kitchen/diner and a sitting room with an electric fire. To the outside, discover off-road parking for one car, a patio with furniture and a first floor balcony with furniture. The Hayloft is a tasteful and cosy cottage placed excellently for exploring the wondrous countryside and coastline of the Lake District National Park. Amenities: Gas central heating with electric woodburner type stove. Electric oven and hob, microwave, fridge, washing machine, dishwasher, TV, DVD, WiFi, selection of books, games and DVDs. Fuel and power inc. in rent. Bed linen and towels inc. in rent. Private parking in front of the property for 1 car. First floor balcony and walled courtyard both with furniture. Sorry, no pets and no smoking. Shop 5 minute walk, gastropub 10 minute walk. Note: Washing machine is in the cupboard in hallway. Town: Lindale is in the south of the Lake District National Park, close to Grange-over-Sands and within Hampsfield Fell. It boasts both a village pub and a Post Office. Grange has narrow streets, quaint buildings, two pubs and a golf course. Cartmel, with its sticky toffee pudding, horse racing, 12th century priory and restaurants is a fine visit. Be sure to explore the countryside of the Lake District National Park, as well as the popular resort of Bowness-on-Windermere. Over three floors. Two second floor bedrooms, 1 x double, 1 x twin. First floor bathroom with bath, shower over, washbasin and wc. First floor sitting room with electric woodburner type stove and balcony. Ground floor kitchen/diner and entrance hallway. Gas central heating with electric woodburner type stove. Electric oven and hob, microwave, fridge, washing machine, dishwasher, TV, DVD, WiFi, selection of books, games and DVDs. Fuel and power inc. in rent. Bed linen and towels inc. in rent. Private parking in front of the property for 1 car. First floor balcony and walled courtyard both with furniture. Sorry, no pets and no smoking. Shop 5 minute walk, gastropub 10 minute walk. Note: Washing machine is in the cupboard in hallway.